In early 2017, releasing the new SendPro C—an all-in-one device for office mailing and package shipping—gave our UX design and research team at Pitney Bowes an opportunity to reevaluate how our clients unpack and install it. With our previous product, users sometimes struggled to install the printhead, but they were still able to eventually complete the installation. So we never really paid much attention to that process. Times have changed. This device is Pitney Bowes’s new flagship product and the embodiment of our entire business model: to reinvent the way people think about sending. We wanted them to have a great experience using it—right out of the box. So, we grabbed this chance—early in the design process—to fix some legacy installation issues. Our research told us that the installation for the printhead and ink cartridge could use some attention. Our UX design and research team wanted to create a smooth out-of-the-box experience—an easy installation workflow that anyone could complete. Our goal was to give every client confidence, from the moment they first open the box, that their new device is modern and easy to use. The setup for the SendPro C consists of a series of steps that mix physical installation with software setup. We needed each step (and its instructions) to be clear and in logical order. Our guidance needed to provide enough detail that anyone struggling with the installation of the printhead would have adequate help. 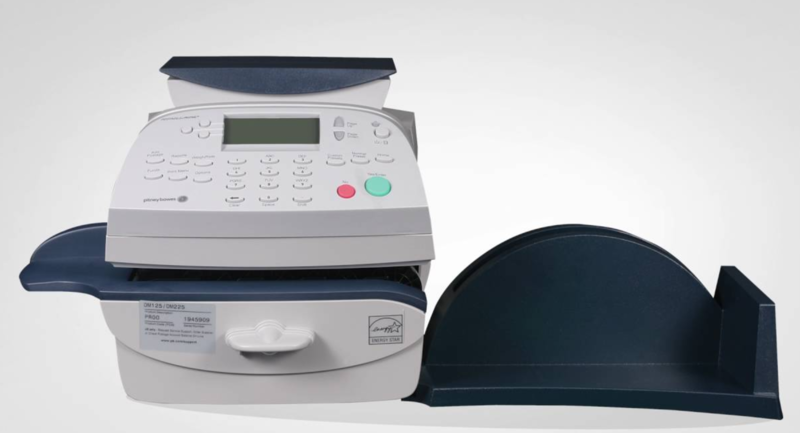 SendPro C is one of the first postage meters to use a touchscreen. We initially thought we could use this feature to our advantage by putting all of the instructions on the device screen, using little or no paper. This made sense because we knew, based on years of testing, that users tend to ignore printed instructions. But then we remembered that installation of the printhead and ink cartridge occurs underneath the touch screen lid. The user needs to flip the screen up and away from their line of vision. Thus, putting instructions on the screen was no longer a viable option. The user needs clear, accessible step-by-step instructions, especially during key moments like printhead and cartridge installation. We considered how we could get the user the needed information despite this new wrinkle. Our solution was to to provide the user with 2 sets of instructions—one on a piece of paper inside the box and a duplicate of those same instructions on the device touch screen. We knew that users tend to toss paper instructions and that the touch screen would be flipped up for part of the process. So, our expectation was that if users missed the instructions in one place, they could find them in the other. In March of 2017, the design team was ready to test our theory. We conducted one-on-one studies with 8 clients who currently use a postage meter. Our first user was Jill, an office manager at a law firm. Jill opened the large box containing the SendPro C device and its peripherals. She took everything out and plugged in the device. 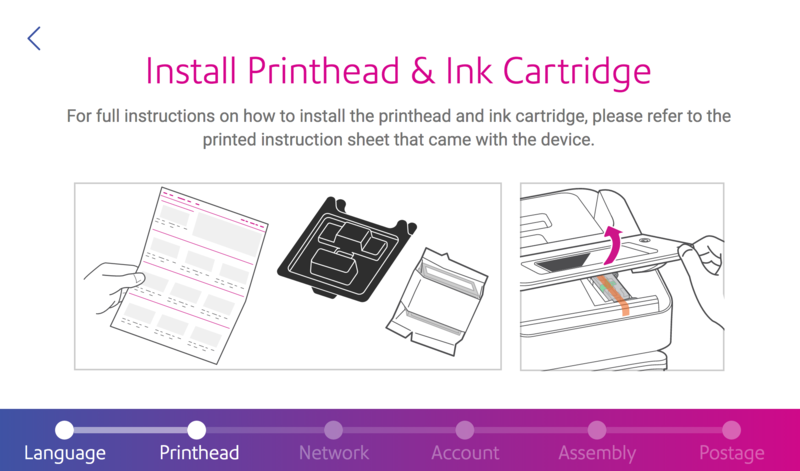 On its screen, she observed a set of instructions that read: “Install Printhead & Ink Cartridge.” In her hand, she held a piece of paper that said the same thing. Jill looked back and forth from device to paper, paper to device, and she began to turn red—she looked embarrassed and overwhelmed. She wasn’t sure which instruction to follow. Although both instructions were identical, Jill (and our other test users) told us that having the same set of instructions in different places made them feel lost and confused. They didn’t feel confident that they’d be able to complete the installation by themselves. Our clients need guidance. This observation reinforced a popular psychological theory that people crave structure and rules. Having identical instructions in 2 separate places created uncertainty and wasn’t helpful. The onscreen instructions were useless. Installing the printhead and cartridge required precision. If a user didn’t follow the steps exactly, the screen would be stuck. This is because it advances to the next installation step only after installation of the printhead and ink cartridge. As a result, the user wouldn’t know how to proceed. In May of 2017, the team conducted a second round of one-on-one testing with a new set of 8 postage meter clients. Tom (a receptionist at an accounting firm) opened the box and immediately tossed the instructions aside, just like Jill did. But now we were ready for him. When he powered on the device, he saw a screen that told him to refer to the printed instructions. Looking around, Tom realized that the printed instructions had “slipped out” of the box. He promptly located and began to follow them. At this point, Tom gained a sense of confidence that he could complete the installation on his own. Tom told us that the structure provided by the device was comforting. With this reassurance the installation process felt easy to him and this perception continued for the remainder of the install, which went smoothly. After round 2 of design testing, we’d solved the problem. 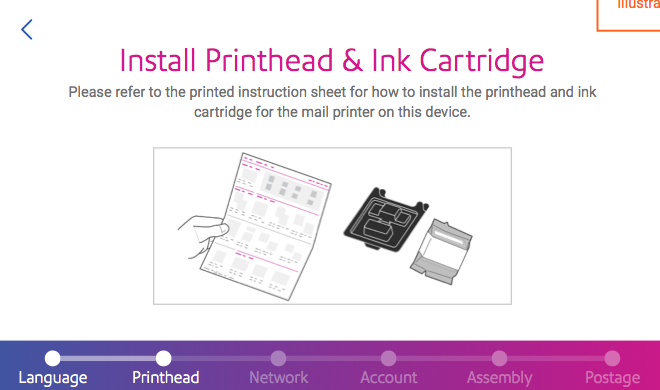 Users were able to understand why they couldn’t proceed without first installing the printhead and ink cartridge. And we guided them to the instructions for doing so. This approach forced users who had missed or discarded the printed instructions to read them. Those instructions told them exactly what to do in the clearest of terms. In the second round, all 8 participants successfully completed the out-of-box setup—with confidence. Our goal was to guide users through a complex setup scenario using everything in our designer’s toolbox. But by testing, we learned that regardless of how intuitive and descriptive a set of instructions may seem, our clients need more—they want to know where and when to look at what. And they do best when they’re focused on one thing at a time. A single source of guidance was better than 2. In hindsight, our solution seemed obvious. But it took teamwork—listening to each other and to our users—to reach the ultimate solution. Lessons learned.